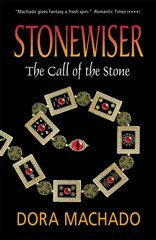 The Stonewiser Series Is Free! 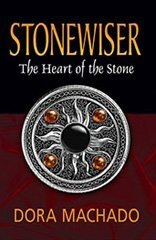 The Stonewiser Series is Free this Weekend! NOTE: link to download your ebook will be sent within a week of subscribing. A very warm welcome, and thank you for taking the time to visit with me. I know that there are a lot of terrific authors out there and some awesome books competing for your attention, so if this is your first time here, thank you for your interest in my novels. I sure hope I can tempt you to give one of my books a try! The Curse Giver won the 2013 ForeWord IndieFab Silver in Fantasy! The Curse Giver is now available as an audio-book on Audible.com. The Curse Giver is an award-winning finalist in the fantasy category of the 2013 USA Best Book Awards. http://www.USABookNews.com. Dora Machado's short story, Adrift, is available on Kindle as part of the Relic and Remains anthology edited by Ty Schwambeger. 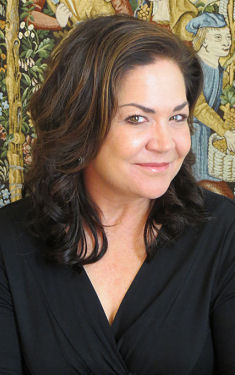 Dora's latest novel, The Curse Giver, is available at Amazon.com, Kobobooks.com and your favorite independent book seller. The Curse Giver is now available in Kindle, Nook and all other versions. 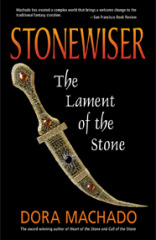 Stonewiser: The Heart of the Stone is now on sale for $.99 on Kindle. You can find Dora Machado on Facebook and follow her on Twitter. Look up Dora Machado as one of the cool women of Twitter. The complete Stonewiser trilogy is now available on Kindle. NEW: Listen to Dora being interviewed on Stories From Unknown Authors! A healer on the run. A condemned lord pledged to kill her. A land torn apart by war and intrigue. A terrible curse that can't be revoked, defused, or defeated. Dare to meet the curse giver. A fast-paced, plot-twisting fantasy packed with powerful characters who will challenge the tenuous boundaries between love and hate, good and evil, justice and revenge. ©2012 Dora Machado. All rights reserved.